The first post I did for this blog was on the subject of tracker dogs giving evidence in court - or more accurately, their handlers. That's all the justification I need to jump on board this story doing the rounds, thanks to the Daily Mail. 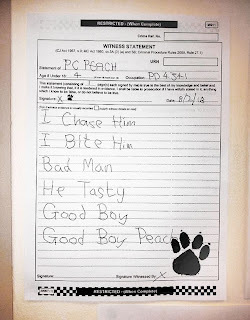 When prosecutors in Britain requested a statement be taken from an officer named Peach, his West Midlands Police colleagues decided to provide one, notwithstanding that Peach is a 4-year old German Shepherd. 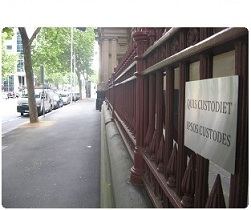 The matter is currently the subject of 'internal investigation'. Well that has provided a few laughs around the office this morning. Very funny. Grrrr .... Everyone in the dog box enjoyed it, too!